Bodyboarding is one of the most dynamic forms of surfing. Immersed in the water you’re engaging directly with the wave and its power. From the outside the sport seems timeless, the same classic shapes in use. However bodyboarding technology is changing radically taking your performance and fun to whole new levels. So let’s check it out. While there’s rivalry between bodyboarding and surfing, to its credit bodyboarding has led the charge both at many of the world’s heaviest surf locations and in progressive manoeuvres. Challenging breaks that have been opened up by bodyboarding include Teahupoo, Shark Island, Ours, to name a few. Manoeuvres like 360s, airs, even backflips – all mastered in bodyboarding before coming to surfing. Just as bodyboarding a wave has radically changed from laying prone to super high performance, so too has the technology used to progress the sport. If you check images of bodyboards from the 1980s shapes are all but identical to today’s models. However the materials technology has radically evolved. There are multiple types of advanced foams in use in the internal cores. The external layers both for the deck and slick are enhanced delivering ever-higher performance and durability. Internal stringers are now used, as in surfboards, including interchangeable stringers. There’s new rail and bottom designs. So, what you see on the outside of today’s bodyboard is not an indication of the high tech beneath. The outline shape is called the template. The nose is the flat area at the top of the board. The tail is the area at the back. The rails are the sides. The widest point is normally back from the nose where your elbows are placed. This is where you turn from both to spin to catch waves and to flex your board so you can carve once on the wave. Quality brands offer board sizes in relatively standard lengths from 22″ to 36″, 38″, 40″, 41″, 41.5″, 42″, 43″, 45″. So there’s a size to cater for every size surfer. Within a range some boards run slightly wider due a Signature rider’s preference. Some also have their wide point forward or back. For example boards with narrower noses with their wide point back can be good for Drop Knee surfing. The most common tail is a crescent shape. This provides two edge points so helping turn to the left and the right. Another alternate tail is called a Bat tail. Here the back of the board extends outward, opposite that of the Crescent tail. This Bat tail is said to give speed by giving you extra area. Other variations on tails tend to cycle in and out of fashion. Bodyboards may appear flat and most today are pretty much flat. The curve of a board from nose to tail is called rocker. Rocker helps the board do carving turns on the wave. A flat rocker gives you speed which is good to have as a Beginner. You do not want a board with much of a preset rocker, a rocker you can see. The reason why boards appear flat or close to it, is that in doing advanced manoeuvres riders flex the board into the rocker they want as they’re surfing. Going into a turn they pull the nose toward them so creating more rocker helping with the turn. Coming out of the turn they stop flexing so the board returns to its flat shape and they gain speed. This flexing is a key component of bodyboarding and many alternatives in materials and design, discussed below, focus on flex characteristics. Beginner boards normally feature a stiff foam core called EPS, expanded polystyrene. One of the big improvements over the years is that this foam is 100% waterproof. So if your board gets dents and dings it won’t take on water negatively affecting your performance and fun. Other foams used for cores include PE, PP and hybrids. Without getting too complicated, foams have a density that equates to flex. When compared in a similar context PE is considered the flexiest, PP is stiffest. So in the simplest terms a board with a PE core will flex and carve better while a PP board will be faster. Both PE and PP have recoil and memory characteristics. Recoil means the foam will spring back after being flexed. Memory means it will return to its original shape. PE has several draw backs. If it gets exposed via a ding it’ll take on water. It can over-flex, especially in warmer water, becoming slow to surf. Ways around this include adding stringers and mesh to stiffen the board. PP is the presently the most popular core amongst Pro riders. It’s lightweight, has strength and great recoil and memory. It’s buoyant so allows for thinner boards with more sensitivity. PP boards still have stringers and mesh. One problem with PP is that it can over stiffen in colder water so reducing the responsiveness of your board in turns. There’s also NRG, a foam part way between PE and PP that’s become popular, and Hybrid cores. Hybrids have a mix of foams, for example a softer main core with stiffer foam segments or inserts. On the top deck and sides there’s a similar slightly denser version of the PE foam. Coming in two types, one smooth and one rough, these foams are super durable. They can take the constant wear of your body rubbing on it, and the odd bang and bump. Most Beginner decks are just plain flat, while others include contours. Contours, such as nose bulbs, that also can be on the bottom of the board, and body grooves, help you hold on so you don’t slip. You can also wax your deck so you get additional traction as needed. Bumpers are denser sections of foam added internally at the nose and tail to provide protection and durability. The smooth bottom of the board is called the slick. It’s the most substantial material used in the exterior of the board. It’s solid while still providing flexibility, recoil and memory. The material used in the slick is often referred to as HD, or HDPE, another type of polyethylene. In higher end boards the slick can be a similar more advanced material called Surlyn. In general terms HD is plastic-like, once it creases your board is generally finished. It will never surf the same again. While Surlyn is rubber-like, it’s used to cover golf balls, and has better recoil. It’s less likely to crease and if it does the creases often will not write-off your board. The sides of your board are called rails. The pieces of foam and sometimes HD that cover the sides angle out from the top and bottom to meet and form the rail. 50/50 is the most common rail description and means that the top and bottom rail pieces have the same length. Other common rails are 55/45, 60/40 and 70/30. Each of these indicates the bottom piece of rail, referred to first, is longer than the top piece. The 50/50 setup provides a balance between turning and generating speed. The more the bottom rail edge increases, from 55, 60, 70, the speed of the board from the rail shape increases and control decreases. A new rail innovation is the Vax Trax, where instead of angling outward the rail angles in. This is a feature said to give you more control for carving without losing speed. Boards can have flat or channel bottoms. Channels provide water flow and so aid board speed. They also help your board hold in sucky waves. Most channels are graduated from nose to tail. Twin channels are common. There’s single channels and more recently quad four channels are also an option. Stringers are a material added into the foam core. Most commonly they would be a tube a centimetre or two in diameter. In entry boards this tube could be plastic. 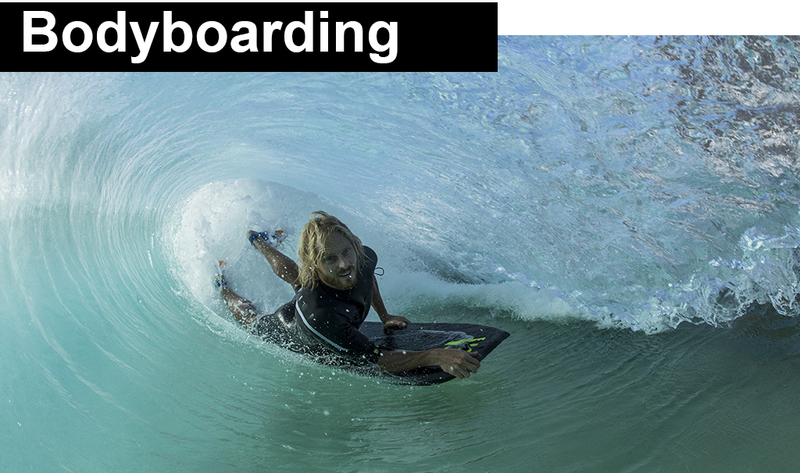 In advanced boards they’re fibreglass, carbon or some other advanced composite material. They run from close to the nose to close to the tail of your board. The idea of the stringer is to control the way your board flexes. They will stiffen a core and add recoil and memory. Fibreglass being more flexi, carbon less. Multiple stringers can be incorporated to control the way the sides and middle of your board flex. Stringers can also be added in the form of a hybrid core with denser foam segments. Once again the aim is to control the way your board flexes. ISS, the Interchangeable Stringer System, is an innovation that allows stringers to be changed or not used at all. This allows your board to be changed dynamically. For example If you see the surf conditions offer heaps of carves you could go for a flexi or no stringer setup. If it’s barrelling or you want to launch, a stiffer stringer will help your board maintain speed. Mesh is a fine and plastic-like layer added internally to your board. Most commonly added under the slick but can also be under the deck. It gives an alternate flex pattern. For example it can make your board stiffer while adding more dynamic recoil. It’s lightweight and has minimal volume so can be added achieving a specific set of characteristics such as board volume or weight. As a Beginner, while not needing all the fancy features, you want the best board you can get. You want to ride the open wave face not just bounce around in the foam. So first, your board has to have right dimensions. If it’s too small it won’t float you and you won’t get going. If it’s too big it’ll be unwieldy and you won’t be able to direct yourself where you want to go. As a guide you can hold your board against your body and it should fit from your chin to your knees. If you’re heavy for your size, go for a bigger board. If you’re light for your size, go with a smaller board. An entry level board from a known brand with an EPS core and HD or better slick will have quality materials to give you good surfing and reasonable longevity. Helpful additions will be bumpers aiding durability, and some might include a deck plug and leash. Be aware that no-name boards look the same but have poor quality materials that will quickly crease or de-laminate rendering the board useless. As a Beginner you may do most of your surfing keeping your bodyboard flat. You go along the wave angling to the top or bottom. Progression means controlling your board with greater skill to do more on the wave. For example to do turns you start curving your board so you carve. With a board that gives release you can do a 360. With control over your speed you can stall for a tube, or speed up to launch for an air. Being able to control your board for these types of manoeuvres comes down to controlling its flex and speed. Advanced board materials help you with that control. The reason there’s so many variations in materials such as types of foams, and stringers, mesh and other bodyboard features is that they all provide certain characteristics. These will help you surf in a certain way to do specific manoeuvres or to match certain surf conditions. For example a board may have a combination of foam, stringers, mesh so that it performs well in most surf conditions. Another may have another combination optimised for launching airs. So you can look at the combination of board materials and characteristics to match what you’re trying to achieve in your surfing, or what might work best in certain surf conditions. The Stealth Speed Dealer 2.0 Bat Tail Dirty Dozen uses a PP core. This core is stiffer but in our water temperatures will give base level flex, not too flexi or too stiff. The decks are PE with contours and nose bulbs so help your grip. The slick is Surlyn so gives great speed, recoil energy in and out of turns, and durability. Internally there’s a single stringer and mesh incorporated on the inside of the slick to maintain form and distribute across the board, also aiding durability. Graduated twin bottom channels provide speed along with a Bat tail adding additional speed. Rails are the new Vax Trax providing bite and control even in the biggest most powerful waves. The rails also help balance the speed from the Bat tail. Stealth describe this board as having great memory. So once you pull on it in you’ll carve then when you release you get an energy dynamic in a out of turns. The board returns to its flatter rocker shape optimising speed. Science Bodyboards Pocket Tech PE. Science Bodyboards have defined their range in terms of the main types of surfing you’ll be doing. They have their Pocket model optimised for carving, doing turns, in the wave pocket. There’s the Launch for launching air moves. And the Style for all-round versatile surfing. A quick look at the Pocket you can see it’s basic specs include a PE version. This has a softer foam core so can flex for gouging carves in sucky and power waves. It’s got 55/45 rails so not over rated for speed. These rails are good for manoeuvrability, easily transitioning from rail to rail as you carve up then cut back on the wave face. It has a double stringer that will provide plenty of recoil memory while adding strength and durability. The Surlyn slick finishes of the board giving speed and durability. Today’s technology gives you an unmatched bodyboarding experience. The designs, materials and features can be combined in endless performance combinations. So you can get a surf experience to match your skill, the surf conditions, or your own specific repertoire of moves. Never has there been a better time to get one or several boards to enjoy. To check our great Bodyboarding gear and buy online click here.